Running PulseAudio in system mode is usually a bad idea. 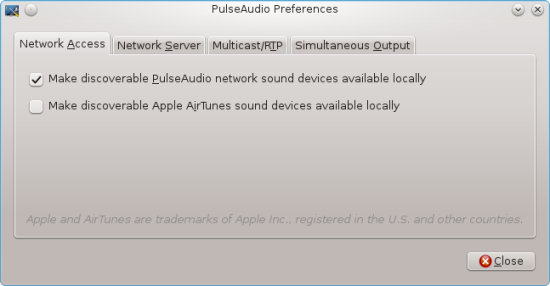 There are use cases however, where PulseAudio’s system mode is a great tool, e.g. for building a PulseAudio streaming target to stream audio from multiple clients to speakers. Since the use cases of PulseAudio in system mode are limited, distributions usually do not ship a systemd unit for it. For a list of available options, have a loot at the pulse-daemon manpage. drwxr-xr-x  3 root root      180 Nov 18 09:45 .
drwxr-xr-x 19 root root     3.2K Nov 18 09:45 ..
For a list of available module options, consult the PulseAudio module dokumentation, especially module-native-protocol-tcp. auth-anonymous in particular might be a questionable idea in larger environments. An IP based access control list (auth-ip-acl) or a cookie containing some random data that serves as a shared secret between server and clients (auth-cookie) could be a more feasible approach. Use paprefs to make remote sound devices available locally. Don’t forget to restart the PulseAudio server afterwards! There’s a bug in Fedora 20 and RHEL 7, where the legacy network service does not set the default route properly. This is due to the fact, that the network service does not evaluate the GATEWAY0 directive in /etc/sysconfig/network-scripts/ifcfg-ethX that is used by NetworkManager. Of course, you have to set DEFROUTE=yes, too. Note that this is going to be fixed in Fedora 21. Link aggregation is a method of bundling interfaces together to act as one for increased bandwith and/or failover. One of most used protocols, next to a couple of proprietary ones, for controlling such a channel bond is LACP, the Link Aggregation Control Protocol. Of course, depending on the actual network topology, your mileage might vary here. Again, depending on your topology, you might want to add/edit you default route to go over the aggragate interface. While the squid proxy server has quite a few different flavours of authentication available, one of the most basic ones, pam_auth, is also one of the most useful ones to get you started quickly. pam_auth let’s anyone who has a local account access the squid proxy. In large environments you probably want to use ldap authentication eventually, but pam_auth is great for testing purposes. Since the documentation on squid is quite comprehensive, there’s no need to go into detail. You can also look up individual configuration directives Configuration Reference Manual. Please note, that it’s not recommended to use pam_auth for authenticating to a local unix shadow password database. You should at the very least make sure, that it’s in a directory, regular users can’t access. Baikal is a lightweight, free and open-source CalDAV and CardDAV server implementation that allows you to synchronize your address book and appointments with multiple clients such as mobile devices or a desktop application like Thunderbird. It lacks a couple of important features for enterprise use cases, such as address book and calendar sharing between multiple users, but it’s very suitable for a small office or home installations. Since it’s very lightweight and only depending on php and mysql, it’s also quite fast and stable. Installing kvm on a recent Fedora OS is quite easy. Fedora already ships all the necessary software packages and kernel modules for running a kernel virtualised machine. There are a couple of ways to give your virtual machines access to your network. For a reference, have a look at the Networking page of the kvm documentation. The easiest way is to add the virtual NICs of your virtual machines as well as the physical NIC on your server to a common bridge. Finally, disable the NetworkManager service, enable the network service and reboot the machine. You can now go ahead and connect to the libvirt-daemon with a GUI, like virt-manager or install a virtual machine with virt-install. Keep in mind, that you can use individual logrotate configuration files from /etc/logrotate.d/ but settings are inherited from the global logrotate config /etc/logrotate.conf. For a comprehensive list of options, have a look at the logrotate manpage. Setting up an ownCloud instance is rather straight forward. OwnCloud6 rpm packages for recent Fedora versions (20+) already exist and can be easily installed with yum. Unfortunately, ownCloud’s storage mechanism is rather slow compared to other private cloud solution like Seafile or SparkleShare. However the overall speed can be improved greatly by switching from the most obvious and most popular server choice – an apache server – to nginx, for example. One of the great advantages of using OpenVPN with RSA keys instaed of static keys is the fact that you can easily disable access to the server for a specific client without the need to re-create keys for any other client. This is called revoking of client certificates. Since every single client’s certificate is verified against a Certificate Revoking List (CRL), disabling a certificate is rather easy. We simply have to create a CRL file and tell OpenVPN to use it. Any match against the CRL will then result in the connection being dropped. As you can see in the last line, the certificate was successfully revoke (hence the verification error 23). You can also see the revoked status of the client’s certificate in the keys/index.txt file. An “R” in the first column indicates, that the certificate was revoked. Next, we need to tell OpenVPN to verify incoming connections against against our CRL. Copy the crl.pem file to the OpenVPN config directory and assure, that’s it’s readable to the user running the OpenVPN service (usually openvpn:openvpn).